Anyway, since I am not looking for a job, I am never ever ever going to click on the jobs sidebar, and I'd kinda like it not to be there at all, it gets in the way of browsing the list of wacky network questions. Can you make that happen, please? 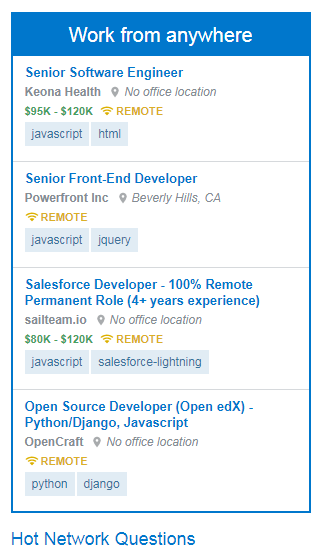 Don't display the jobs sidebar to people who set their Jobs preference to "not looking." We'd prefer to show you only relevant ads, regardless of whether they relate to jobs. As you point out, we have some work to do in this area. For example, job ads do not currently account for your stated job preferences, including whether your status is "not looking." Unfortunately, I don't have a timeframe for when job ads might become more targeted (as targeting relates to explicitly-stated job preferences), nor do I know whether or how your request will be implemented. If we do implement something like you are requesting, we will also want some means of encouraging users to update their job status. Because you mentioned that recruiters have been contacting you, I double-checked whether any recruiters seemed to be sending you messages through Stack Overflow. It doesn't look like it, at least not at all recently. If they were, we would consider it a serious bug because you should not be appearing in an employer-user's candidate-search results at all if your status is "not looking" (which it is), and those users should likewise be unable to contact you through Stack Overflow. If that has not been your experience, please let us know so we can fix it. 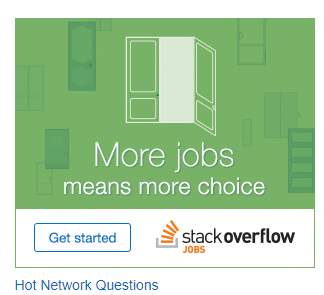 This is internal advertisement of Stack Overflow, they're not going to turn it off. This is not intrusive, rather small sized, and usually looking nice. I see no reason to remove it. If you don't want a new job, simply ignore it, same way you probably ignore most advertisements in other sites.